I feel it in my fingers, I feel it in my toes… Christmas is near! Since the season of giving is upon us, I decided to come up with a little something for you, dear readers. I hope you like my early Christmas present! I bring to you… drumroll, please… comdoll-related themes to look out for in 2012! But wait, there’s more! Along with my list of potential comdoll themes, I also put up a review on how the AUD-gold and CAD-oil correlations fared for the past year! Let’s begin, shall we? RBA to cut rates once more? Recall that the central bank implemented two rate cuts before 2011 ended and could be ready for more in 2012 unless the Australian economy shows signs of picking up. With plenty of economic threats on the horizon and with the slowdown in global demand, AUD/USD might be forced to stay down under next year. That’s exactly what the School of Pipsology lesson entitled “As Gold as it Gets” was all about! AUD/USD and gold prices moved hand in hand for the most part of the year, except for the time when the S&P slapped the U.S. government with a debt rating downgrade. Prices diverged at that time as traders ditched both commodities and the U.S. dollar. 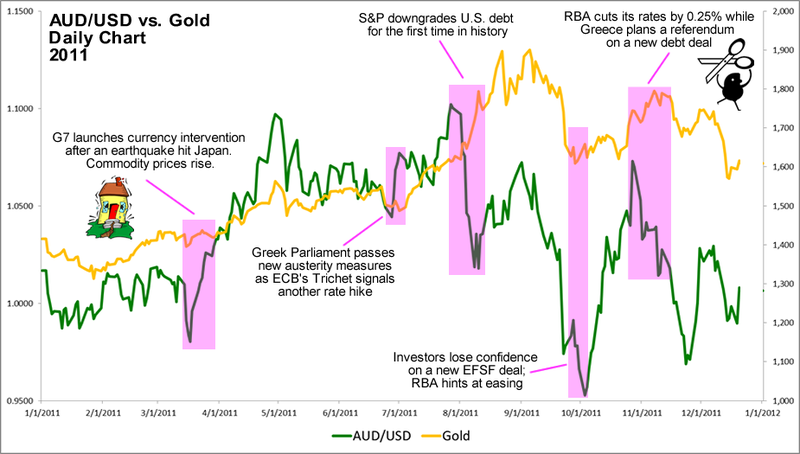 Towards the end of the year, although gold price action became more volatile compared to AUD/USD, the positive correlation between the two still held. For the past year, CAD/USD (yep, I flipped USD/CAD) and oil prices moved like they’re on Dancing with the Stars! 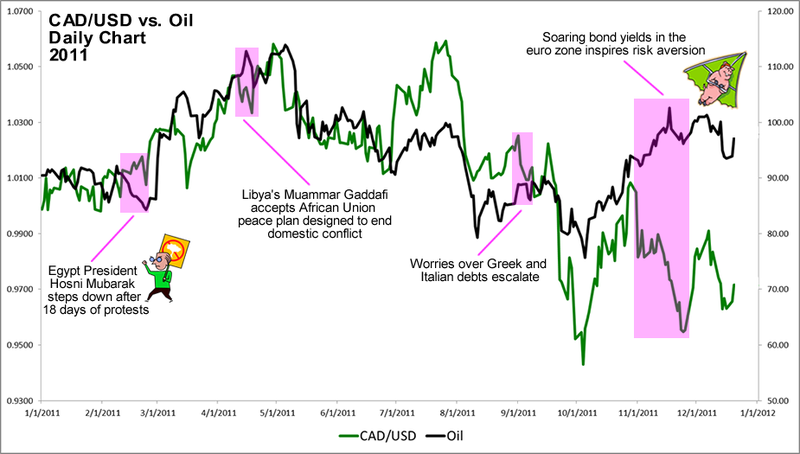 Notice that of the four noteworthy instances when CAD and oil weren’t in sync for the past year, two of those occasions have something to do with events in the Middle East. Remember, this is the region where the world’s largest oil producers are. In late February, Egypt’s President Hosni Mubarak stepped down from his post and eased investor concerns of a halt in oil production in the country. Then, in April Libya’s Muammar Gaddafi accepted a peace treaty that aims to end the conflict in the country. Libya has the largest oil reserves in Africa, and is the eighth largest in the world. As Forex Gump mentioned, the OPEC decided to set a higher target for oil production (30 million barrels per day, to be exact) for 2012. More oil supply could drive prices down, which could weigh on the Loonie for the rest of the year. From what we’ve witnessed in 2011, the PBoC sure knows how to be aggressive with its tightening moves. With that, their monetary policy could continue to dominate the airwaves and affect the comdolls. After all, Forex Gump thinks they could start loosening up now that inflation no longer seems to be a problem in the country. That’s it! Have I missed any other events that might influence comdoll trading? As always, I’d love it if you share your ideas on one of the links below!